Im not going to go too far in depth with this one as the wiring diagrams and the screen shot of my settings is pretty straight forward. but if you do have any questions post them up here and i'll try me best to answer them. 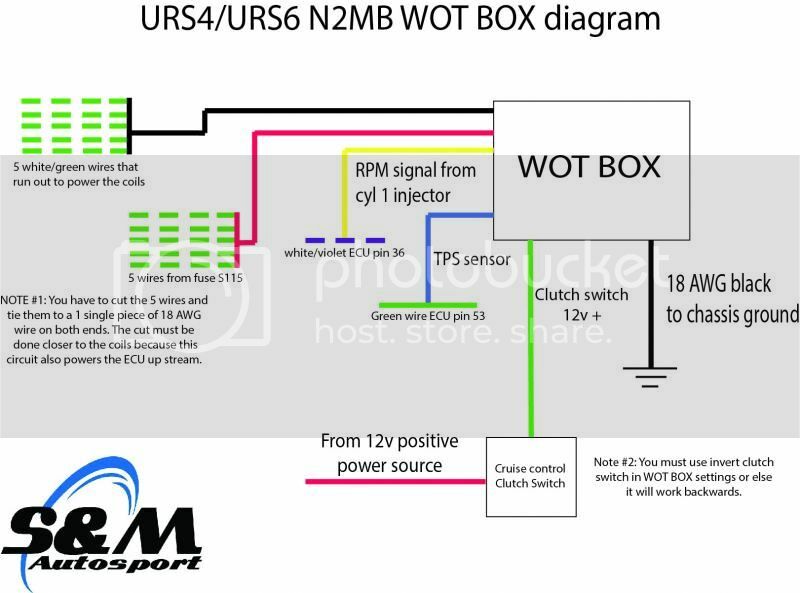 Basic wiring diagram for installation of the WOT BOX into URS4 & URS6 cars. Screen shot of my settings. To change the PID settings you have to go to the options drop down and choose expert mode. it will ask you for a password, the password is PIDControl and it is case sensitive. you must put the PIDC in caps and ontrol in lower case. This will give you a good launch control setup along with no lift shift, nitrous controls and even a shift light output. the only down side is if you want the big bangs and fire you have to jump over to my other thread on here that explains how to modify the ECU and the wiring associated with it to get the big bangs and 15+ PSI boost standing still. This still interrupts the power to the coils and makes 5 to 8PSI standing still. its not some lowered rev limiter that doesnt really do much of anything like i've seen with a few other factory ECU options out there. Link to the other thread with the ECU modification part. I have attached both normal firmware V3.2 and my special firmware V3.5. V3.5 is so that you can have the rev limiter option when you are using OTHER ignition settings. the V3.5 is a little flaky but the V3.2 works perfect. If your happy with your stock ECU and tuning but want real ignition cut launch control control and no lift shifting this is the solution to saving yourself 1000's of dollars over buying standalone just to get these features. Enjoy guys and have fun! I dont have any affiliation with N2MB and im not making any money at all off of this. im posting this information to provide the 20V turbo community with a cheap, simple and flexable solution to have launch control and NLS because and lets be honest here, there isnt many other options out there. N2MB WOT BOX firmware interface V3.5. this is the one that allows rev limiter with universal ignition settings. Last edited by vwnut8392 on Fri Jan 30, 2015 6:09 pm, edited 1 time in total. Didn't know they made these for urS cars. Cool! Their pretty much universal for any car really. the neon guys developed it but weren't prejudice against making it work on more than just dodge products. i actually used one on an S13 nissan 240sx with SR20DET swap converted to SR20VET. SR computer rev limiter is topped out at 7000rpm. 7000rpm if FE in hex and if you set it to FF it disables the rev limiter. with the car being a drift car it needs a limiter plus the VET head can turn to 7500rpm safely. 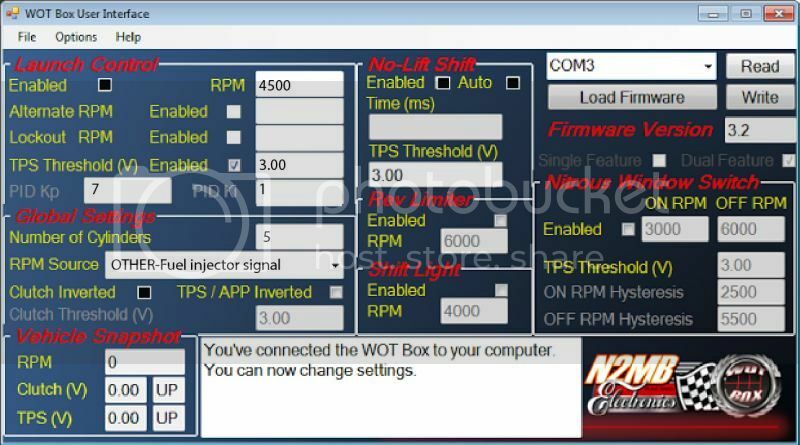 i also used the nitrous controls in the WOT BOX to control the neo VVL or variable valve timing! the nitrous is an RPM based on/off switch so it was perfect. i had to rewrite the WOT BOX firmware to allow rev limiter control when other ignition source is selected but over all it works perfect and the driver/owner took second over all in the mid west drift union competiton. over all its a great little device and can be used for many other things than what N2MB intended to be used for.